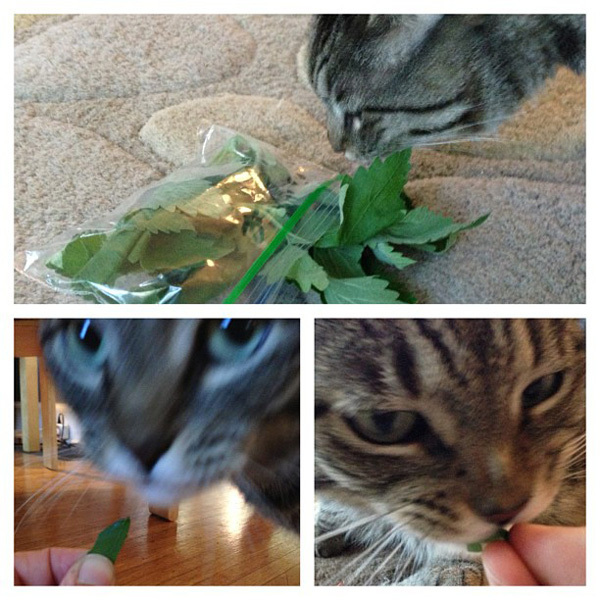 My friend Paulette gave Stewie some catnip she grew at home. It seems like he can take or leave catnip that is dry. I've seen him munch on some that my friend Aprille dried. I was curious to see what he would do with the fresh. He didn't go crazy over it like some cats. Some sniffing and then if I would tear off and hold little pieces he would eat it. Why I have to hold it is beyond me. I think he likes making me hold stuff for him. No rolling around or other drugged cat antics. There was some crazy pug antics though. One whiff and Oscar wouldn't stop rolling in the catnip. I shot this instagram video of it. Watch how Stewie stalks off disgusted at the end.